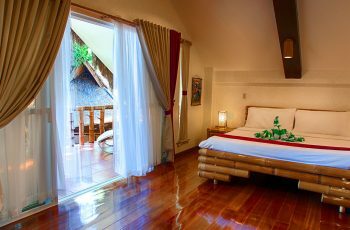 The Dolphin Family room is the largest room in Pura Vida featuring one (1) queen size bed and two (2) single beds with a small partition in between. The room is on the ground floor underneath the Suite and is therefore also wheelchair accessible. A natively furnished terrace offers a soothing garden view. 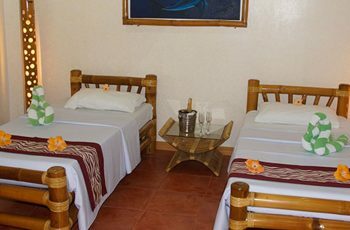 The room comes with split-type air-conditioning, mini-bar refrigerator, in-room safe, complimentary water carafe, complimentary coffee and tea making facility, and flat screen cable TV. The bathroom features hot & cold shower and can be accessed from both sleeping areas. 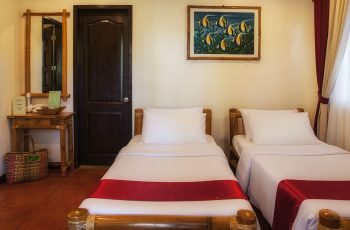 “Pura Vida is a wonderful place to unwind.” Pura Vida is known for its Sea Explorers diving operation and their boats and staff were busy taking good care of their guests. Our family doesn't dive but we were quite content relaxing on the beach, cooling off in the ocean and the pool, and enjoying the spa. This is not Boracay, so if you are looking for a lot of people and hustle and bustle, look elsewhere. If you are looking for a wonderful place to unwind in a beautiful setting, this could be exactly what you are looking for.